In Minneapolis, and around the country, working people need political representatives who are not for sale to big business. Raising over $100,000 with a median donation of just $20, Ginger’s campaign, like Bernie Sanders’, shows it’s possible to run a powerful campaign based solely on grassroots donations, entirely free from corporate cash. Meanwhile, big money is flooding into Minneapolis’ elections. Two of Ginger’s DFL (Democratic Party in Minnesota) opponents, Steve Fletcher and Tim Bildsoe, both have said point-blank that they will accept money from big developers. These are the same developers who exploit Minneapolis’ unaffordable housing crisis, building luxury condos and apartments priced out of reach of working people. Millionaire developers like Steve Minn have even set up their own independent PAC to influence the elections in their favor. City establishment kingmakers Sam and Sylvia Kaplan, who have donated over $400,000 to pro-corporate Democratic Party campaigns and are fiercely opposing Berniecrats, were among the hosts of a recent lucrative fundraiser for Steve Fletcher. It has become increasingly clear that the DFL establishment is hell bent on trying to defeat insurgent left campaigns, and particularly the socialist candidate who led the way on the $15 minimum wage. Time and time again, politicians make progressive promises. But at the end of the day they cannot serve two bosses, big business and working people. We need independent candidates who refuse corporate contributions, as part of the project of building a new political party that’s not for sale. We need a fighter for working people in Minneapolis City Hall. Don’t let big money buy this election. 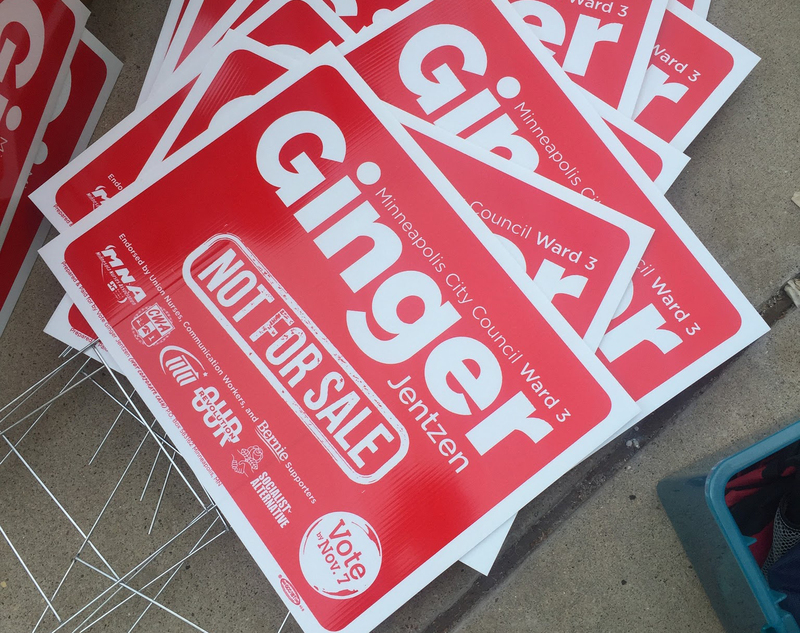 Please chip in to Ginger Jentzen’s campaign at www.GingerJentzen.org/donate. Next articleCatalonia: Step Up Mass Movement Against Spanish-Nationalist Reaction!